This week I received a call from an old Real Estate client that I was referred to two years ago. At that time she was looking forward to moving to San Diego to be near her boyfriend. In 2013 I met with her and discussed the Market Value of her home. I left thinking that it was a good meeting and I should be listing the property soon. Sometime went by and there was no communication from her. I followed up to see what I could do to help her with her decision. She told me that she had been diagnosed with cancer and would be postponing the listing until she dealt with this. I told her that I understood and would pray for her and also request a prayer group keep her in their prayers as well. I found out later that her condition was diagnosed as terminal and she was given 6 months to a year to live. Two years later on July 25, 2015 I received an email from her asking if I remembered her. I replied that I did, for sure, and asked how she was doing. She told me a story about how she and her boyfriend had cancelled a vacation on Viking cruises because of the cancer diagnosis. They still have Plane tickets that they couldn’t cancel and decided to go see her boyfriend’s sister in England. They made contact and found out that the sister was planning a trip to Lourdes and she asked if they would like to go with her. My client and her boyfriend said yes and they all went on a tour of Lourdes. When she returned to the U.S. she had a follow up appointment with her doctor. They checked on her terminal cancer and told her that she would need to come back for another appointment. The doctor could not find any trace of the cancer in her. On subsequent appointments they could not find any trace of the terminal cancer. She has been told she is Cancer Free. 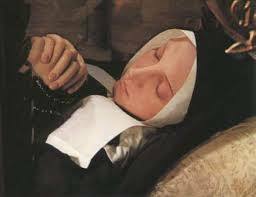 The picture below is of Saint Bernadette of Lourdes. Her body never decayed since the 1800’s. Click on the link to read her story and understand why people are attributing Miracles to her.